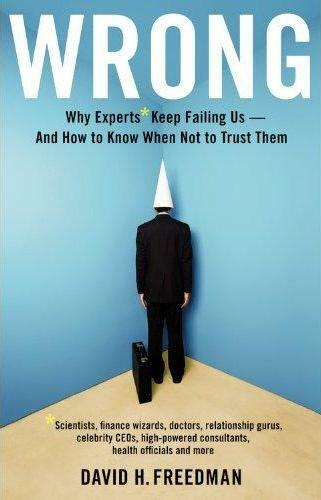 My most recent book is called WRONG: Why experts keep failing us–and how to know when not to trust them. It’s about all the forces that push experts, be they top scientists, high-powered consultants, pop gurus, financial whizzes or journalistic pundits (like me), into misleading us with flawed advice, and discusses ways to tell good expert advice from the dubious stuff. It’s published by Little, Brown. You can find it on Amazon here, and Barnes & Noble here. My feature article on John Ioannidis, a researcher who explores the problems with medical science and who is prominent in WRONG, was the lead feature article in The Atlantic in its annual Brave Thinkers issue in November, 2010. Bravo!….Admirable and disarming….What makes WRONG so right—it being as good as any general account of the fragility of what we take as expert knowledge—is that it raises the right questions….Invigorating. An exposé of the multiple ways that society’s so-called experts let us down, if not outright betray us. It’s a chunk of spicy populist outrage, and it can be a hoot….It’s news you can use. To read the factoids David Freedman rattles off in his book WRONG is terrifying….Why, then, do we blindly follow experts? Freedman has an idea….why we believe experts, how to find good advice and why we should trust him – even though he’s kind of an expert. Forcefully argued….Startling….Convincing….Makes a powerful case for the prevalence of scientific ineptitude. [Three stars.] Ours is unassailably the age of the expert….What, asks David Freedman in his combative new book, is the status of their collective wisdom?….A brisk interrogation of the extraordinary fallibility of even the most lauded and garlanded of our contemporary experts…. [An] exposure of so many sources of contemporary scientific error…..Sober advice. [A “Buzz Board” pick.] Rightly argues that the expertise epidemic isn’t just the fault of charlatans, but the population at large that demands the most dishonest shamans who come with an endless supply of simple, emotionally resonant elixirs. No audience is more gullible than the business community, which gleefully applies irrelevant “case studies” to their businesses and never wonders why their companies fail to become Apple or Google overnight. ….Really drives home the dubiousness of much–if not most–of what passes for expert wisdom….If WRONG is right, the magnitude of the problem is much greater than most people suspect….we’re awash in untrustworthy advice….so common are the serious errors catalogued in Wrong by even the most eminent researchers and institutions, though, and so influential are false claims in directing the flow of dollars and in propping up whole industries and reputations….On the surface, Wrong is about the untrustworthiness of expert advice, but it has much deeper implications. Mind-bending….Crafts a compelling case….I have read many books on why well-intentioned (and sometimes ill-intentioned) purveyors of information make mistakes….Freedman’s book [is now] my most-recommended text. As David Freedman documents in WRONG, experts know a lot less than they claim….There are such powerful and perverse institutional incentives for experts to overclaim the validity of their data and their conclusions, we should not be shocked that many ambitious scientists succumb to the I-have-figured-out-all-the-answers temptation….It is not just that data can be manipulated. We must worry about the very incentives “experts” have for fudging their results. He builds on the rather sound premise that a disturbingly large percentage of this purportedly professional advice is flawed–and there are systematic reasons why many expert communities go off-track. Experts, Freedman argues quite convincingly, don’t know what they’re talking about most of the time….He offers an impressive array of reasons for the unreliability of experts….Freedman’s frontal assault on practices in the hard sciences….shows that scientific studies are often inconclusive, misinterpreted, sweetened, or even outright fraudulent. …A sobering job of reviewing dozens of studies of ignorance, bias, error and outright fraud in recent academic science….Helps to explain why medicines that can do unexpected harm…make it to the market. An all-out assault on experts, and, perhaps more significantly, our mindsets….His two chapters on the trouble with scientists is likely required reading….The book is well written, and will shake you up…Follow some of his guidelines when the next expert promises to fix your organization. If you have ever been exasperated by conflicting expert opinion on swine flu, the latest miracle drug or global warming (or is it “climate change”? ), WRONG is the right book is for you….A useful and entertaining (when it is not disturbing) guide to the reasons experts are mostly wrong and how we can learn to recognize advice that is likely to be right….Disarming…enlightening….We need not be helpless before conflicting expertise. A merry chase down the road of skepticism….In accessible language, Freedman explains the flaws that all too easily worm their way into research….After pulling the rug from under the reader’s feet on every imaginable topic….provides 11 “never-fail” rules for not being misled. By far one of the most interesting non-fiction books to have come out in recent times. I’m sitting in a coffee shop in a pediatric hospital in Boston, hard by a nine-foot-tall bronze teddy bear, with a man who is going to perform a surprising trick. I’m thinking of an article recently published in a prestigious medical journal, an article that reports the results of a research study, and he will tell me whether or not the study is likely to turn out to be right or wrong. It’s the sort of study that your doctor might read about, and that you might learn about from a newspaper, website, or morning TV news show. It may well be that the results of this study will change your life — they might convince you to start eating or avoiding certain foods to lower your risk of heart disease, or to take a certain drug to help you beat cancer, or to learn whether or not you are carrying a gene linked to vulnerability to a mental illness. But this man won’t need to hear any of the particulars of the study to perform his feat. All he needs to know is that it was a study published in a top journal. His prediction: it’s wrong. It’s a prediction that strikes at the foundation of expertise and our trust in it. ….I’m not going to spend much time trying to convince you experts are often, and possibly usually, wrong. Instead, this book is about why expertise goes wrong, and how we may be able to do a better job of seeking out more trustworthy expert advice. To that end, we’re going to look at how experts–including scientists, business gurus and our other highly trusted sources of wisdom–fall prey to a range of measurement errors, how they come to have deep biases that lead them into gamesmanship and even outright dishonesty, and how interactions among them tend to worsen rather than correct for these problems. We’re also going to examine the ways in which the media sort through the flow of dubious expert pronouncements and further distort them, as well as how we ourselves are drawn to the worst of this shoddy output, and how we end up being even more misled on the Internet. Finally, we’ll try to extract from everything we’ve discovered a set of rough guidelines that can help to separate the most suspect expert advice from the stuff that has a better chance of holding up. About two-thirds of the findings published in top medical journals are refuted within a few years. As much as 90 percent of physicians’ medical knowledge has been gauged to be substantially or completely wrong. Economists have found that all studies published in economics journals are likely to be wrong. Nearly 100 percent of studies that find a particular type of food or a vitamin lowers the risk of disease fail to hold up. Professionally prepared tax returns are more likely to contain significant errors than self-prepared returns. In spite of $100 billion spent annually on medical research in the US, average life span here has increased by only a few years since 1978, with that small rise mostly due to a drop in smoking rates. There is a one out of twelve chance that a doctor’s diagnosis will be wrong in a way that will cause significant harm to the patient. Not a single NFL coach or manager was able to spot much potential in future-record-shattering quarterback Tom Brady, leaving him nearly undrafted by the league after college. Genetics tests are one-tenth as accurate at predicting a person’s height as guessing based on the height of the parents. Most major drugs don’t work on 40 to 75 percent of the population. Hearing an expert talk impairs the brain’s ability to make decisions for itself, according to brain imaging studies. A drug widely prescribed for years to heart-attack victims killed more Americans than did the Vietnam war. Only about one percent of the scientific studies based on fraudulent data are identified and reported. One-third of researchers admit to having committed or personally observed at least one act of research misconduct within the previous three years. Two-thirds of the drug-study findings that indicate a drug may cause harm are not fully reported by researchers. Ninety-five percent of medical findings are never retested. Half of newspaper articles contain at least one factual error. Sixty percent of newspaper articles quote someone who says the reporter didn’t get the story straight. Three-quarters of experimental drugs found safe and effective in animal testing prove harmful or ineffective on humans. A third of the studies published in top medical journals contain statistical errors. Appendix 4: Is This Book Wrong? I went to my local library and thought, “I wonder which is the first book in the library shelves here?” (They are shelved based on the Dewey decimal system). There in the first slot was 001 Fre: WRONG. I smiled and just had to read it. I’m glad I did. It served as a poignant reminder that one should keep a grain of salt at the ready, and allow for a dose of skepticism whenever reading anything. Thanks. Among those factoids are expert studies showing experts are wrong. What does he make of that? I just read the book, and loved it. It was so resonant! 😉 Maybe a problem is that we are expecting THE answer to things that we just can’t know. If that’s the case, the consequence gets applied to our lives is that there are so many people who have power over us — real power that when ignored involves civil and/or criminal charges. Legislators create laws based on what some expert is saying that makes us do something or keeps us from doing something that we find out later was unnecessary or harmful.